There is loads more to Scottish salmon fishing than most people would care to imagine and in my opinion it's a far more diversified subject to master than golf, shooting or even driving a car. The irony is that anyone can go out and buy fishing equipment and the salmon fishing permit to a salmon beat without ever having had a lesson on how to fish. You cannot do that with a car nor would you likely get away with it on a shoot and you'd certainly be made to hit a few targets by your stalker prior to being allowed to take a shot at a deer. On a golf course you'd make a spectacle of yourself if you kept losing your ball due to a dodgy swing but least a salmon fly is tied on so not quite as embarrassing! The easiest way to learn how to be effective with a salmon rod is to book a professionally guided salmon fishing day with a 'reputable' professional salmon guide. That doesn't mean a guide who's posing as a professional but what I'm referring to is a guide who can catch salmon for fun and one who has 'served his time' reading the river, is renowned for productivity and has some 'natural flair' for hosting guests. These types of professionals are fairly rare and often commercially unavailable and shy away from giving away too many trade secrets. There are however a few dedicated souls who love to assist and pass on their knowledge to others. Salmon fishing is a never ending trip of fascinating revelations that will hold your attention for life if your introduction is effective and you're suitably inspired. 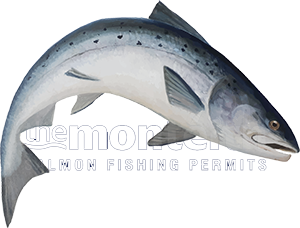 The things that really matter in salmon fishing are firstly having the right equipment levels and knowing how to effectively cover a salmon pool with either a fly rod or a spinning rod. You must also have a good understanding of how to set the hook which from what I've seen over the decades is the biggest 'enigma' in this entire business as still thousands of salmon hooking opportunities are needlessly lost each year on the Scottish rivers by ineffective hooking habits that may once have worked when all rivers were absolutely teaming with fish and chances were numerous so capitalising on individual salmon takes was not as important as it is today. Over my professional river career I've developed some fantastic friendships with some of the most expert professional salmon men in Scotland across our big four Scottish rivers Tay, Dee, Spey & Tweed. These men are on top of their game and are true walking talking salmon fishing encyclopedias who can inspire a tactful solution for any salmon fishing scenario or question. I've also personally seen thousands of salmon anglers with one or two major flaws in their game that could easily be rectified whether it be an incorrect lift with a Spey line or a lack of ability to space each swing of their fly 'optimally' through a pool or even how to make all salmon takes count! A professional 'time served' salmon guide will instantly re-align the slightest of errors and explain the logic behind all required tweaks so these adjustments are fully & instantly understood. Moving forward I see a much more informative salmon fishing approach where proper fishing skills are passed onto salmon anglers prior to or early into their salmon fishing careers. I see this knowledge being delivered in numerous new ground breaking methods with particular focus being placed on the younger generation who are sadly currently lacking from this fantastic 'natural' pursuit. I also see more ground breaking forerunners in the management of Scottish salmon fishing proving to their river fishers & other river management rivals the 'no-brainer' value of significantly bolstering their natural stock levels via wild smolt ranched stock forcing other less agile or stubborn fishery boards to get their arses into gear and to stop poking their river management and national responsibilities with a stick!